Physical characteristics: Striped honeyeaters are about 8.5 inches (22 centimeters) long and weigh about 1.4 ounces (40 grams). Their cheeks and the area from the forehead to the nape (back part of the neck) is dark with white stripes. Their underparts are a pinkish buff, and upperparts and tail are grayish. Geographic range: The birds are located in eastern Australia, from mid-north Queensland to northern Victoria and west to the York Peninsula, especially inland from the Great Dividing Range. semiarid woodlands with eucalyptus, acacia, and native pine. Diet: Striped honeyeaters eat nectar from eucalyptus, mistletoes, and other plants, and sometimes eat fruits and seeds. They also occasionally eat insects and spiders that they capture from foliage and tree bark or that they catch in the air. 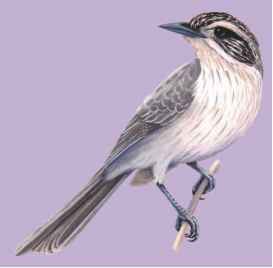 Behavior and reproduction: Striped hon-eyeaters are usually found in pairs or small groups. They sound an attractive whistling song. The generally do not migrate, but do show local movements. 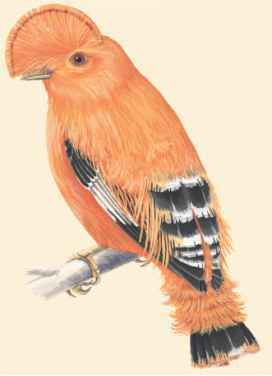 The species breeds from August to January. Nests are suspended off of drooping foliage. They tend to like to build nests near gray butcherbird nests. Females lay from two to five eggs, with three being average. Both parents incubate the eggs. After hatching, both parents feed the young, but sometimes have helpers feed the chicks. The time it takes to hatch the eggs is sixteen to seventeen days, while the fledgling period is also sixteen to seventeen days. Striped honeyeaters and people: People sometimes regard them as pests in orchards. Vireos and peppershrikes are small, plain-colored songbirds with a somewhat heavy to very heavy, pointed bill that has a small hook at the end. For most species, the wings are either rounded at the end or are more pointed. Their legs are short but strong. Vireos and peppershrikes are commonly olive brown, olive gray, greenish, or yellowish on the upper parts, and white, light gray, yellow, or yellow-washed on the breast and abdomen. A black line runs through the eyes of most species, but sometimes a white strip goes above the eye while in other species a light-colored eye ring is present. A pale wing-bar is usually seen. Females and males are colored almost the same. They are 4.0 to 6.25 inches (10 to 16 centimeters) long and weigh between 0.3 and 1.5 ounces (8 and 40 grams). The family ranges widely over the Americas including most of the continental United States, all but the northern-most parts of Canada, Mexico, and Central America, most of South America including as far south as Uruguay, northern Argentina, and northern Chile. Vireos and peppershrikes are found in boreal (northern), temperate, and tropical habitats including woodlands, scrublands, and forests. Some prefer the forest canopy (treetops), while others like dense undergrowth, forest edges, or mangroves (tropical evergreen tree of tidal coasts).